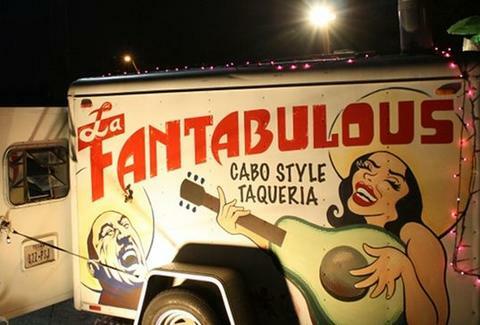 A moonlighting project from the J Black's chef, Fantabulous serves up sweet-marinated Cabo-style oceanfront fare out of a trailer adorned with a woman in a sombrero playing an avocado-bodied guitar (playing that old time guac' and roll). Nearly everything's baptized with queso fresco direct from Veracruz, starting with the Pescado (pan-fried snapper, grilled onions, avo) and daily specials like salsa-verde splashed oysters and tostadas piled with blackened tiger shrimp, also what nurses wrote on Jack LaLanne's hospital admittance report after a juicer prototype explosion. 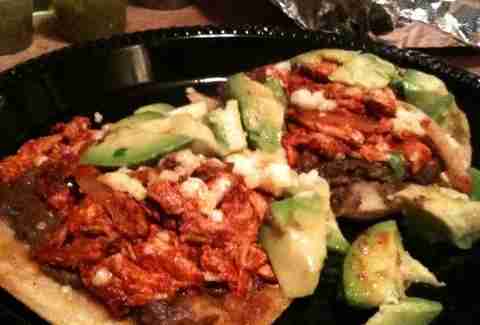 Tortillas also get meaty, with the Bistek (grilled skirt, onions, poblanos, cilantro), the Pollo Achiote (grilled chicken in citrus marinade, carm'ed onions, pineapple, cilantro), and the shredded chicken/sweet pepper adobo sauce/black bean/avo Pollo Tinga Tostadas -- which one Sunday every May will hopefully be renamed "Tinga Tu Madre"
Playing to a beach bum's budget, they're also trotting out breakfast options filled with the usual suspects as well as chicharones and cactus, all for $1 -- if your dad had known about these tacos, maybe you'd still have all your toes.